Home › Agriculture › AFOLU in Brazil: What’s the Big Deal? AFOLU in Brazil: What’s the Big Deal? When it comes to GHG emissions and climate change, Brazil is a bit of an oddity. Around a third of its current power generation comes from renewables (namely hydroelectricity), it is a pioneer in biofuels and ethanol production, and it almost uses no coal. But still, Brazil is the world’s 5th largest source of GHG emissions including LUCF. How could this be? The simple answer is AFOLU. Agriculture, Forestry, and other Land-Use (AFOLU) account for over 77% of its emissions profile as highlighted in our recent report “Brazil and Indonesia (Land-use and agriculture).” Its agricultural and LULUCF emissions account for 10.36% and 37.26% respectively of the global totals for each sector. While energy production and transportation are relevant emitters as well in Brazil, its most significant strides can be made in land use and agriculture. While Brazil has seen progress in decreasing the deforestation of the rain forest and other sensitive biomes, it faces significant development challenges in combining the benefits of agricultural growth, environmental protection, and sustainable development. Brazil should focus its efforts in these areas to reduce deforestation and promote low low-carbon agriculture so as to achieve maximum emissions reduction. Due to this extremely unique emissions profile, our report focuses on deforestation and agricultural emissions in Brazil as well as barriers to mitigation and recommendations to overcome these barriers. To preface the report, I would like to point out an issue in the forestry and agricultural sectors. Deforestation (LULUCF) is by far, Brazil’s largest source of emissions. However, agriculture and livestock have become key sectors for growth in the country. As it so happens, these are the two major drivers of deforestation due to steady territorial expansion of farmland and pastureland over time that has resulted in the conversion of significant native vegetation and forestland. To myself and many other researchers, this has led to a blurred line as to what constitutes agricultural emissions versus forestry emissions. 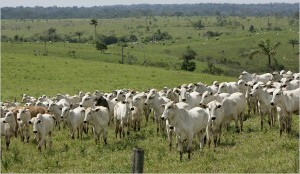 In the case of Brazil, many argue that all land-use emissions should be considered as agriculture emissions. The upshot of this debate is that to combat deforestation, Brazil will have to incorporate effective low-carbon agriculture techniques into its long-term policy strategy if it wants to meet its emissions reduction goal of 36%-38% by 2020 relative to BAU. Why is agriculture resulting in such extensive deforestation rates? Two words sum up over 80% of domestic deforestation: cattle and soy. 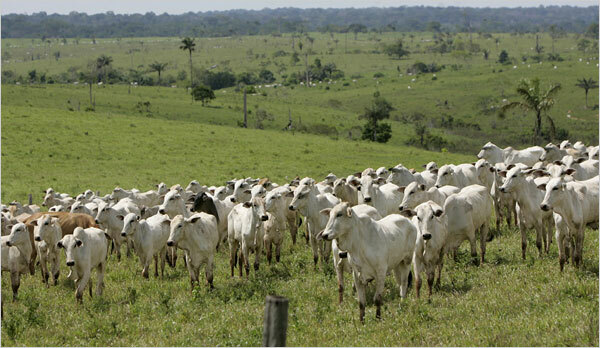 About 62% of deforested land in the Amazon ends up as cattle pasture and beef production alone drives 80% of Amazon deforestation. Burning, both legal and illegal is widely used in the Amazon region to prepare new crop and pasture land. Significant institutional gaps, especially between legislative power and legal authorities, make enforcing environmental laws in the Amazon region extremely difficult. 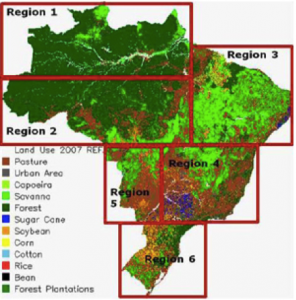 The map below shows the distribution of Brazilian land by activity. The locations of soy production and pastureland should be noted. As the largest beef exporter in the world, with about 1.5 cattle per person (out of over 200 million people), it should be no surprise that this industry carries so much weight. It has become the status quo that opportunity costs of not deforesting are far too high for cattle ranchers. In addition, the global price of soy is teetering around an all time high at the moment. This combined with a weak Brazilian Real has made soy export more attractive than ever. Although soy is not produced in the Amazon, its expansion often displaces cattle ranchers, forcing them to move deeper in to the rainforest. Therefore, soy is a significant indirect driver of deforestation. While I have only given you a brief opening of the extremely convoluted and intricate AFOLU sector in Brazil, our recent report provides up to date data and in-depth policy analysis on the subject. The road will be long for Brazil to save its most precious resource. Engaging civil society and large agribusiness companies while at the same time tackling governance and institutional barriers will require extreme patience and dedication. All is not lost and there is hope. Beef and soy should be the primary targets followed by low-carbon agricultural practices for smallholders. Finally, law enforcement and forest monitoring must be strengthened if anything success is going to attainable. Stay tuned for the release of our report more information of this for Brazil and Indonesia.